• Grassroots group rallies citizens against financial corruption. READING, PA.—Americans from around the country converged on this struggling eastern Pennsylvania city on September 25 to demand banking reforms as part of a national protest organized by the grassroots group Americans for Banking Reform (ABR). 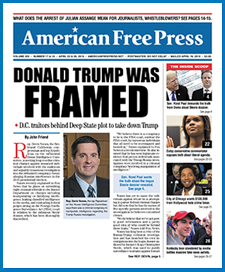 AMERICAN FREE PRESS was on hand to monitor the growing public awareness of the appalling monetary mischief carried out routinely by central and commercial banks. AFP spoke with ABR founder Mickey Paoletta at the rally to understand just how deceitful the financial system has become, in its ceaseless quest to create a nation of paupers ruled by a plutocratic minority kept in power by deception. ABR’s goal involves defeating the fraudulent money and credit machine in court, case by case, under a workable plan in which “loans” are invalidated based on the documents and literature of the banking system—whose sensitive internal bank ledgers show that banks neither loan their own money, nor their customers’ money. Eventually, the group wants to replace the Federal Reserve and its private “debt notes” with public interest-free money. As the rally commenced, Pastor Wayne Sedlak, who is involved in an especially egregious case helping his wife, Lori Dohrmann Sedlak, ward off an attempted foreclosure of their Wisconsin home, spoke to the crowd. Sedlak told the protesters: “[My] case in Wisconsin could itself be a study in the failure of America’s judiciary and its love affair with the banking industry. Imagine being presented with not one, not two, but four completely different “original” loan notes presented in different courts over five years, yet all declared to be the same original note. “Imagine being faced with ‘witnesses’ who assume another’s identity, signatures forged, judges who bury evidence, courts that discard historic legal precedents and discard rules of evidence. . . .
Paoletta announced at the rally that ABR stands ready to help anyone who has fallen under the heel of the banks and needs relief. This involves challenging the very notion that banks make “loans” at all—a critical point that ABR has successfully used in the courts to nullify more than 750 mortgages and credit card “debts” when the banks move to foreclose or collect.